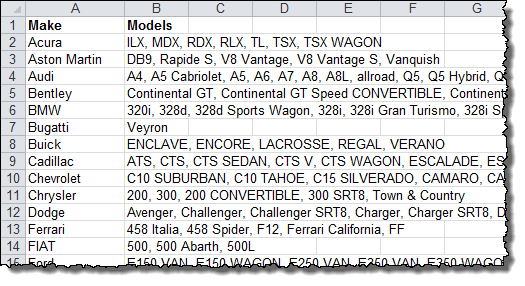 Let’s look at an example data set… In this case, we have a list of all the Makes and Models of cars available in the U.S. for 2014. They are stored in a table with a separate row for each model, so the make of the car is repeated in each row as well. The steps that follow will show you how to get to this result. You have no idea how much time this just saved me. Hours upon hours as we calculate the duplicate registration for our client’s conference attendees. Tricks like these help us clean up our data and provide the clearest picture for our clients. A HUGE thank you! Thanks so much for sharing this. I was doing this manually for a list of streets and page numbers for a mapbook and this saved me loads of time. Great tutorial! Thanks Andrew for your Clear article , saved me a lot of time with a huge excel file. Very clear and helpful. Thanks a lot! This is a solution I’m keeping. Very clever. This is brilliant. I have 2 more layers of complexity in the Model column in the situation I am facing. 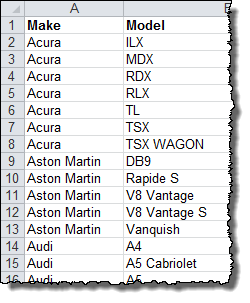 So when I concatenate, I have the value for ACURA as ILX, MDX, RLX, MDX, RLX. – How do I clean that up to just show ILX, MDX, RLX? Thanks! I need to send this in by 8 AM EST which I am sure would not be possible but any help would be extremely appreciated! Other tutorials on the internet may help you with this problem, but I suggest starting with the Text-To-Columns feature of the Data tab in Excel. Then, you can use the “Remove Duplicates” feature of the Data tab in Excel to eliminate the extra MDX and RLX lines in your data. Finally, you can use this tutorial to get the non-duplicated list to group up again. Awesome. I couldn’t get my head around this but your method makes so much sense. Thank you! Thank you very much for this tip!! Really useful. Thanks so much! This was exactly what I needed and the example made it very easy to understand! Thanks for the clever trick. Thank you SO MUCH! You totally rock! OMG!! You are a lifesaver! I have worked all day manually merging values on a 13,000 row spreadsheet!!!!!!!!!!!!!!!!!!!!!! This literally took it down to under 1,200 in about 5 minutes. Thank you thank you thank you! Woowwwwww… thanx alot Andrew Roberts..
Hey great tutorial. Worked for me. Thanks a lot. This is great! One follow up questions… What if you wanted to show an as of date either before or after the selection? I can’t keep it from wanting to repeat the date. Any solutions? Dude! You da real MVP! Company has been doing this manually for ages. Made me look like everyone’s Saviour. IS THERE A WAY TO APPLY A CONDITION THAT IF THERE IS NO VALUE IN THE ASSIGN CELLS DO NOTHING (=IF(K111=K110,O110&”, “&M111,””)??? Thanks, that is useful. Quicker than writing the formula to do it. Thanks this is great. I have been trying to find a way to do this for ages. I am cuurently trying to concate several dates and I can’t get the first date to format correctly. Subsequent dates do format. This is great! How can I do this when I have multiple columns of data? For example, what if this example also had columns for color, year, and transmission? Hi, Great article! It’s exactly what I’m looking for; however, do you have a quick tutorial on how to do the process backwards? I was given a row with multiple model #’s, however want to split it up into individual rows. How can i go about this? You might look to the Text-to-Columns feature in the Data Tools section of the Data menu tab. This should let you break out the models into individual cells. Good luck! This trick was very helpful and helped save time! I added this formula to a massive file. Now, how do I delete all of the records that I don’t need any longer without manually doing it one by one? I’ve been wasting many hours to merge my data. your solution is so cool. you save my day. I was using the concatenate function differently that was consuming me more time. Thanks. this saved me a an hour. I needed to create a list of 150 sales reps and the states they cover. Added an additional if to compare the states and voila, a useful list. This is just beaaautiful!! Thank you so much!… Wonderfully explained.! I have used it successfully. In addition to this, i have to extract first (left) 5 characters from the concatenated cell and put it in another cell. This is awesome! Is there a formula for the reverse process? I have a list with values in one cell separated by commas and I need to convert it to each value is in a separate row. This was a GREAT video. It helped ALOT when we were combining 10,000 lines. I knew the combination needed an If function but could not develop the formula. Awesome Bro, Good logic, Thanks Lot. I had to combine students attendance and academic standings in order to use V-look up successfully. It’s always great to find helpful and clear tips for Excel. Thank you!! Helped me for large data consolidation, thank you very much !! Thank you so much! You don’t understand how much this helped me! Thank you. I have used it for our Civic Association for a membership reminder. There are a few tables in the dbase (place,member,payment,owner etc) and more than one member with an email address for the same properties. This helped me to use only unique email addresses to send personalized letters to members with a list of ALL the properties included and not a email for every property. I did find a small program from a third party, but will have to pay more than R500 to use it 4 times a year. I HAVE THE DATA IN DIFFERENT COLUMNS LIKE A, B,C, D E, F, G etc but all the cells are not filled, I want that the data in different columns must be copied in a single column say for example H. How ?? I’m using excel 2010. When I use your method, all rows except the last return 0. The last returns the first value. Any suggestions? Every other solution I found required purchasing an add-in or creating a macro.